Medicinal effects of the waters in Mooresville Mineral Springs were reported before 1850 when hogs appeared to develop immunity from cholera after drinking from the springs. This photo of the springs area was published in 1892. The bath house, at left, provided a place for patients to bathe in the mineral waters. 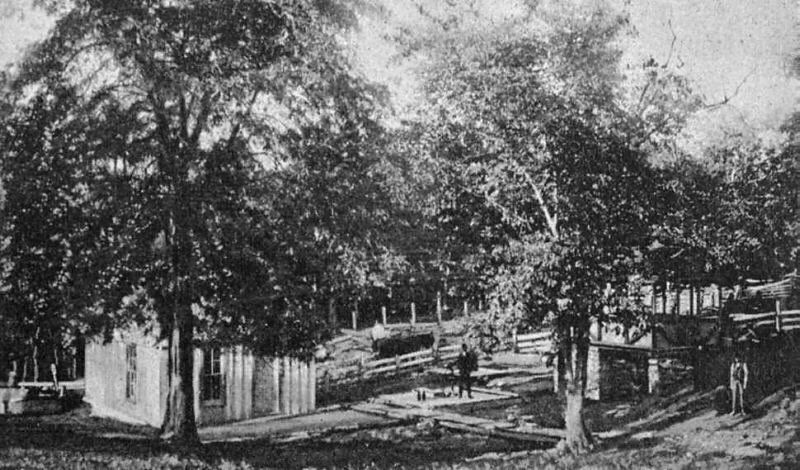 At right is the spring house, decorated with a large letter "M." In the early 20th century a wooden dance floor was installed in the area between the bath house and spring house. Dr. Theophilus Fiske (1834-1908) operated the Mineral Springs Hotel and Sanitarium (above) across the road from the springs. Patients from virtually every state stayed at the hotel or in rented rooms of nearby residents while seeking relief from stomach ailments. Others came to enjoy the social atmosphere at the White Horse Inn or to camp with their families at the nearby free camp grounds. Dr. Fiske's brother Nathaniel "Nat" Fiske (1844-1919) lived near uptown in the first house southwest of the depot. Some spare rooms in the house were rented to travelers and "HOTEL" was painted in large letters on the north side of the house for incoming train passengers to see. 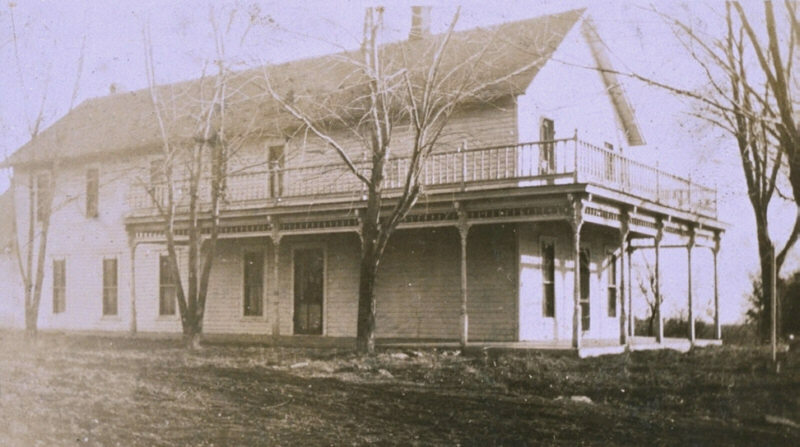 The sign shown above may have been placed on Nat Fiske's hotel for the benefit of travelers interested in going to his brother's hotel in "Springtown." The words "hotel" and "party rates" were probably removed from this sign after Dr. Fiske died and the Mineral Springs Hotel was sold. The springs photo was published in December 1892 by the Geological Survey of Missouri. The Mineral Springs Hotel photo was provided by the late Lela Benson Lawson of Kansas City, Missouri. Thanks to Gareld Dawkins of Mooresville, Missouri for making the sign available for photographing.